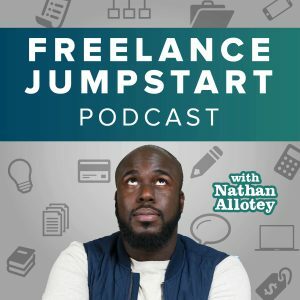 This week for freelance jumpstart this episode is a little different. I had the opportunity and the privilege to speak at a conference this past weekend. The conference was WordCamp NOLA which was held in the City of New Orleans Louisiana. While driving back from Louisiana, I had a conversation with my friend and business entrepreneur Obinna Okongwu. We talked about many things, but one of the things that we talked about was understanding your value and pricing and our respective businesses. I wanted to share the conversation that we had because the takeaways may be beneficial to you and your business. Listen to the audio for the full conversation. One thing that Obinna and I have in common is we went to graduate school at the same time to get our Masters in Business Administration. We learned a lot from that experience, and it made us better business people. One of the reasons we felt the need to get our MBA is because my background was strictly in math and science and his background was in sociology there wasn’t much time for business when we were in undergrad. The main goal of going to school was we both did not know how much we did not know about business. I would advise you learn as much as you can about business because you never know when you’re going to have to apply that knowledge. To have a successful business you don’t need an MBA, and you don’t have to go to school. However, you do need to be aware of the common business knowledge that is all over the Internet that is beneficial to you and your business and can save you time and headaches. All you need to have a successful business is an idea that creates value for others. The next step is to make sure that you get paid the full value for your business service. Will be the first started his business he felt like he was not good enough, so he often looked to his competition to set his pricing. After some time went by he realized his filming and editing skills improved. His quality increase substantially within a year. It finally got to the point to where he felt like he was not getting paid enough for the value he was delivering. He knew his services were worth over $1,000, but he had an ongoing fear that if he raised his prices, he would scare off his customers. Since raising his prices, he now sees that the fear and anxiety was limiting his income. When Obinna started targeting the right type of people, he noticed the conversation changed. In the past people used to contact him for cinematography services and they would ask “I’m interested in using you and your service can you send me a pricing sheet.” When Obinna increased his quality and focused on producing high-quality films people then started saying “I love your videos and your work are you available to film on this date.” These types of people only wanted the high-quality videos and did not care what the price was. From this point of being a targeted quality over quantity. Don’t fight a pricing war, fight a value war. There will always be those types of clients that are looking for a discount. The important thing to remember is not to be undercut. Never settle for something that significantly less than your true offering of what you’re trying to charge. If your services are $5,000 and all somebody has $4,000 you can work with that. If your price is $5,000 and somebody offers $2,000, the difference is too steep, you’re getting undercut. In the past, I fell victim to giving away too much. When it came to web design, I would create the website for someone including the graphics, server management, edit any punctuation or text mistakes that I found, and I would back up the website as well as troubleshoot if there were any issues. The problem with this is I was giving away too many services and an all-inclusive bundle. Because I did not separate out certain common and premium services I missed out on the potential to be paid more. You can’t be all things to all men. Your primary service cannot be all inclusive. All inclusive should be premium, not standard. If you include everything and give it away and one big package like I used to do the client won’t truly appreciate all the value of your doing. Some people want to charge a premium price for their business however they’re not viewed as experts or authorities. If you want to charge a premium price you have to know how your audience perceives you because your price must match your perception. Perception has to do with the quality work that you do your online presence on social media on your website and in person. If the potential customer like trusts and believes in you then you’re that much closer to pricing what you want based on your value and perception. You can check out Obinna at Cakewalk Films.